If you ask 10 jazz fans to name the greatest big-band drummer of all time, chances are that 8 or 9 of the responses will be “Buddy Rich.” An icon of speed, precision, and taste, Rich still has a worldwide following, 30+ years after his passing. Berkshires Jazz is celebrating his 100th birthday year with a concert on July 22, featuring the big band of drummer Gregory Caputo. 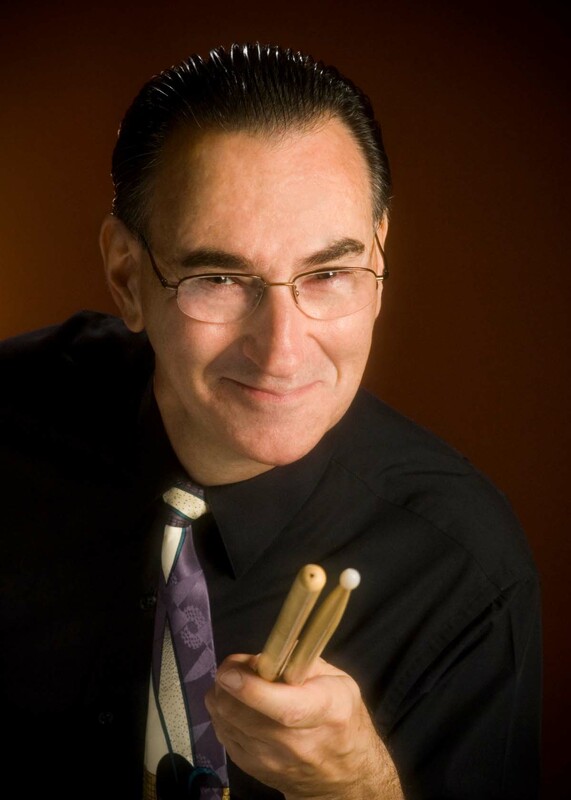 Caputo has always served as a great ambassador for classic swing and big band jazz. His credits include stints with Count Basie, Artie Shaw, Harry James, Nelson Riddle, Benny Goodman, Sheila Jordan, Sammy Davis Jr., and countless world class jazz artists. Local fans remember his appearance in Lee with NEA Jazz Master Phil Woods, which turned out to be Woods’ final appearance in the Berkshires. His big band is a who’s-who of jazz musicians. Called the “keeper of the big band flame” by Jazz Times magazine, Greg’s repertoire is always presented with great precision and spirit. Classic Drummer magazine describes Greg as “a master drummer who speaks volumes in refined sensibilities and superb technique.” An inductee into the National Jazz Archives, he is also on the faculty of UMass’ highly-regarded Jazz In July program. Fasten your seat belts for a great evening of some of the finest big-band material you’ve ever heard. The concert is on Saturday, July 22, 7pm, at the Lee Meeting House (Lee Congregational Church), 25 Park Place in the Berkshire Gateway town of Lee, Mass. A stunning venue, both acoustically and visually, a great place to hear a big band. Tickets are $25 in advance, $30 on the day of the event. Click here for online box office. A centennial birthday tribute to Ella Fitzgerald and the reunion of the New Black Eagle Jazz Band with legendary blues guitarist Duke Robillard highlight the sixth annual Berkshire Gateway Jazz Weekend, June 15-18 in downtown Lee. The four-day festival also includes a Fine Art show, al fresco food vendors with daytime jazz, and a wine and beer tasting under a tent in Church Park. The weekend activities are bracketed by a documentary movie screening on Thursday, June 15 and a Father’s Day jazz brunch. A collaboration of Berkshires Jazz, Inc. and Berkshire Gateway Preservation, Inc., the affair takes place in the western Massachusetts town of Lee, the “Gateway to the Berkshires.” The principal performing venue is the Lee Meeting House (a.k.a. Lee Congregational Church), 25 Park Place. The headline concerts kick off on Friday, June 16, when the Vermont Jazz Center Big Band and Wanda Houston celebrate the 100th birthday of the first lady of song. 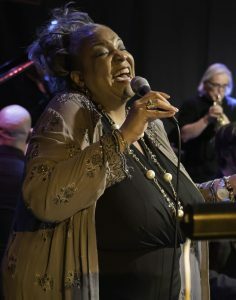 Performing and breathing new life into the same musical arrangements used by Ella Fitzgerald, the concert features acclaimed vocalist Wanda Houston singing Ella’s renowned parts. 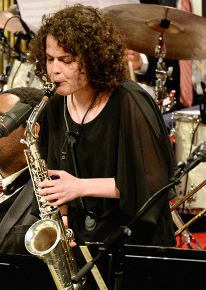 She will be backed by the Vermont Jazz Center Big Band. The repertoire will be a tour-de-force of the great American songbook. Ella Fitzgerald was the most popular female jazz singer in the United States for more than half a century…and perhaps the first jazz artist to become a household name. One of today’s outstanding interpreters of vocal jazz and blues, Wanda Houston has loved –and sung along with– Fitzgerald’s music since she was a young girl. Like Fitzgerald, she is a great singer as well as a superb storyteller; she colors the spaces between her songs with fascinating stories of her youth and the trials and tribulations of life on the road. 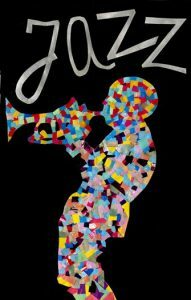 The Vermont Jazz Center Big Band is a professional community band that comes together under the auspices of the VJC to rehearse and take on projects. The 16-piece band is directed by trumpeter Rob Freeberg and features many top-flight ensemble players and soloists. Tickets (click here) are $25 in advance ($30 on the day of the event, if available), and at several locations in the Berkshires, including the Lee Chamber Visitor Center and Wood Brothers Music in Pittsfield. In 2009, the Black Eagles teamed-up with famed guitarist Duke Robillard for a recording called “Nothing But the Blues.” After many years, they are reunited exclusively for the Berkshire Gateway Jazz Weekend. 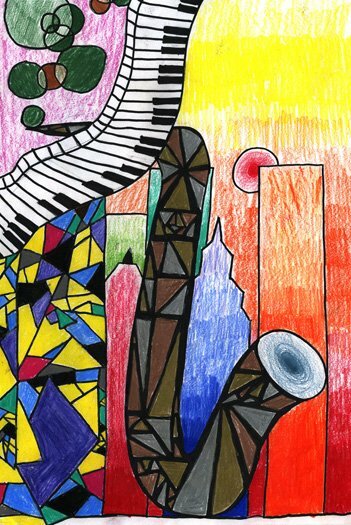 Duke Robillard had his first band in high school, and he was fascinated from the beginning by the ways in which jazz, swing, and the blues were linked. In 1967, he formed Roomful of Blues, and the band was tight enough and tough enough to accompany two of its heroes, Big Joe Turner and Eddie “Cleanhead” Vinson on recordings and in live appearances. The Grammy-nominated guitarist won The Blues Music Awards (formerly W.C. Handy Awards) for “Best Blues Guitarist” four times. The event is supported in part by a grant from the Massachusetts Cultural Council, as well as sponsorships from Big Y, Adams Community Bank, Onyx Specialty Papers, Consolati Insurance, Inc. and Aldam Press. “Thrush Hour:10 great ladies of jazz” with national recording artist Stephanie Nakasian and the Hod O’Brien Trio. In this program, part of Pittsfield’s annual 10×10 Upstreet Arts Festival, Stephanie Nakasian performs selected classic vocal works and describes the historical context of the composition and the original singer. 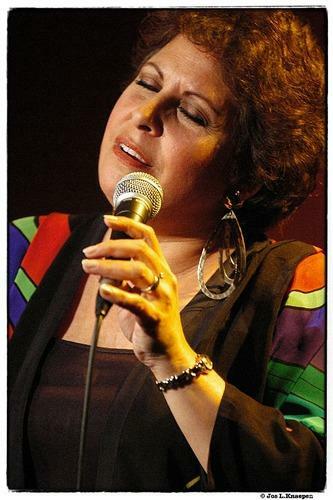 Stephanie is endowed with unique vocal insights and capabilities that enable her to sing in the styles, and with the sensibilities, of her subjects, who range from Ethel Waters to June Christy, Ella Fitzgerald to Sarah Vaughn, Bessie Smith to Abbey Lincoln, etc. $20 in advance, $25 on day of event. Berkshires Jazz is proud to present a centennial tribute to jazz giants Billie Holiday and Billy Strayhorn, who were both born in 1915. 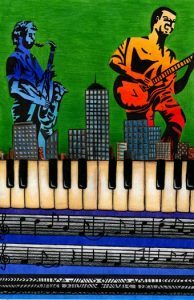 Featured performers are the DeChamplain Trio, who make their Berkshires debut in our Baba Louie’s Backroom series on Saturday, Aug. 15, 8pm. The online box office for tonight’s event is closed. There may be a few tickets available at the door, which will open at 7:30pm. Matt DeChamplain is a one-of-a-kind piano virtuoso, with a range that spans from delicate and intimate to energetic and powerful. A strong improviser and interpreter of the “great American jazz book,” he is joined by his wife, vocalist Atla DeChamplain, and the remarkable bassist Matt Dwonszyk. Atla is “moving by leaps and bounds towards stardom as a jazz vocalist,” according to the iconic vocalist Jon Hendricks, with whom she has appeared. The fast-rising DeChamplain Trio is a group to be reckoned with, and this is a unique opportunity to hear them in an intimate setting. (Translation: limited seating, get your tickets early). The date would also be the 90th birthday of piano giant Oscar Peterson, so you can expect some surprises in the evening’s repertoire. Advance reservations strongly advised; dinner available separately, either in the main dining room at any time, or in the backroom after 7pm. $20 in advance, $25 on day of concert. 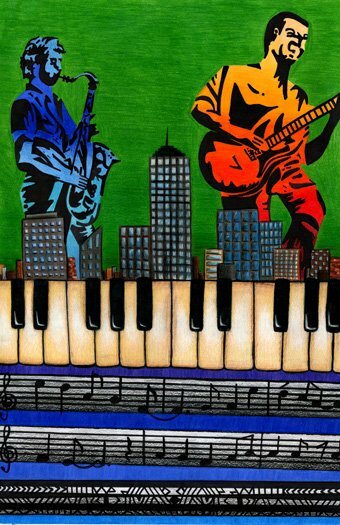 Metro West Thump, the contemporary jazz group from the greater Boston area features originals and favorites from the great American jazz book. After an impressive debut on Third Thursday last October, Metro West Thump takes over Baba Louie’s Backroom as our jazz series continues. Friday, July 10, Baba Louie’s Backroom, 34 Depot St., Pittsfield, MA$20 in advance, $25 on day of concert. Dinner available separately. Rich Falco, founder of the Jazz History Database project that is housed at Worcester Polytechnic Institute, interviews Ed Bride about his discovery of and role in promoting jazz. The wide-ranging interview includes a section on Berkshires Jazz and our dual commitment to presenting concerts, events, and encouraging jazz education in Berkshire County. Among the topics is the founding of the initial Pittsfield CityJazz Festival, the evolution of our Jazz Crawl, headline concerts, Jazz Prodigy series, and other events that make the Pittsfield CityJazz Festival a signature cultural event of the fall foliage season. Jazz education plays an important part in the three other activities discussed in this online video, including the New England Jazz Hall of Fame; American Jazz Venues (whose musical arm, the American Jazz Repertory Orchestra, recorded a DVD in Pittsfield); and the New England Jazz Ensemble.